So how do you plan to spend this Fourth of July? Maybe you're headed to the lake, or a cookout, or a baseball game. You're certainly not planning a trip to the emergency room. Unfortunately, an estimated 8,000 Americans will spend the afternoon or evening of July Fourth not celebrating, but in the hospital ER, getting treatment for a fireworks-related injury. Still, fireworks are synonymous with Independence Day celebrations, even in states where they're illegal (and no, that is not an endorsement). Here are five surprising facts about fireworks in the U.S. According to the National Fire Protection Association (NFPA), 8,600 fireworks-related injuries were treated in emergency rooms in 2010. Those injuries can prove fatal — the association attributes eight deaths to fireworks in 2010. It’s only natural to think that many of these injuries involve some combination of alcohol, older teens/young adults, no parental supervision and powerful fireworks such as Roman candles. But according to the NFPA, 38 percent of those emergency room visits were the result of sparklers and other so-called “novelty” fireworks, and children between the ages of 5 and 14 had twice the risk of injury as the general population. Even well-meaning parents think nothing of lighting a sparkler with a tip burning at more than 1200 degrees and giving it to a 4-year-old. Although 8,600 sounds like a huge number of injuries, it helps to keep things in perspective. The U.S. Consumer Product Safety Commission statistics show that other heat-producing products injure far more people annually, including curlers/curling irons (17,288 injuries in 2010); barbecue grills (19,400) and ranges and ovens (41,416). The difference, of course, is that those injuries are spread throughout the year; the majority of fireworks injuries are clustered around the Fourth of July and New Year’s Eve. Surprisingly, professional pyrotechnicians use only about 10 percent of this figure for public shows, according to the American Pyrotechnics Association. The rest are used in backyards, in the street, etc. Fittingly, China, where fireworks were invented a millennium ago, produces 90 percent of the fireworks sold worldwide. Under the right conditions, all it takes is one spark to create a conflagration. The vast majority of those fires were minor grass and brush fires that in many cases extinguished themselves. However, the NFPA said those fires included 1,100 structure fires and 300 vehicle fires. But the number of fireworks-related fires has been in steady decline for several years, thanks to better public information efforts and strict enforcement of laws banning fireworks and other fires during extremely dry conditions. Almost a dozen states and numerous local jurisdictions canceled Fourth of July fireworks shows set for 2012 because of wildfire fears. Only four states, Delaware, Massachusetts, New Jersey and New York, ban all types of consumer fireworks. Four other states, Illinois, Iowa, Ohio and Vermont, allow only sparklers and other novelty items. An American Pyrotechnics Association study found that fireworks laws have become more liberalized in recent years, with more states approving sales of more items. A dozen states have loosened restrictions on fireworks since 2000. New York almost joined that group, with the state senate and assembly passing a 2011 bill allowing the sale of minor fireworks, such as sparklers. However, New York Gov. Andrew M. Cuomo vetoed the bill at the urging of fire-safety groups. 1. What is the Biggest Fourth of July Fireworks Show in the U.S.? Macy’s 4th of July Fireworks, New York City: This show draws some 2 million spectators, features more than 40,000 shells and is broadcast in primetime on NBC. Boston Pops Fireworks Spectacular, Boston: This celebration in the city where America’s bid for independence began features free concerts, a performance by the Boston Pops and yes, plenty of fireworks, drawing hundreds of thousands of spectators along the Charles River. Fireworks on the National Mall, Washington, D.C. This celebration is so much more than just fireworks, with a parade along Constitution Avenue featuring military bands and floats; a concert by the National Symphony Orchestra, and the fireworks display, which is broadcast on PBS. As far as intangibles, it’s tough to beat a fireworks show celebrating American independence set against a backdrop of some of the country’s greatest monuments. 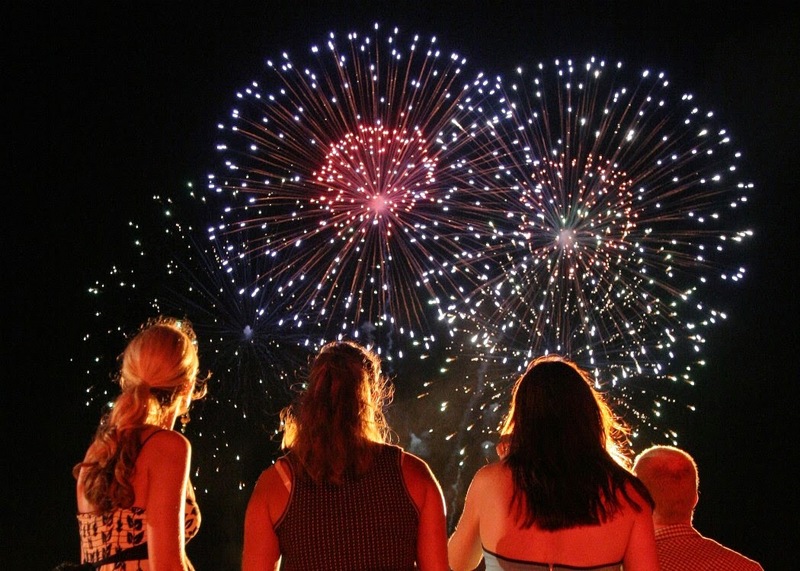 Kaboom Town!, Addison, Texas: This Dallas suburb’s show doesn't have the name recognition of shows in New York, Boston, and other major cities, but you have give props to a town that according to Forbes spends $220,000 on its fireworks show — similar to the budget for the show in Washington, D.C. — and draws around a half-million spectators. A special mention to the annual Thunder Over Louisville event in Kentucky, which serves as the opening for two weeks of festivities leading to the Kentucky Derby. Show organizers bill the event as the “largest annual pyrotechnic display in North America.” And while more than a half-million spectators see the show each April, it wouldn't be a stretch to call it a Fourth of July celebration, as the American Forces Network rebroadcasts it around the world each July Fourth. Not gonna lie, I've never really gotten all the excitement over fireworks, especially with how dangerous they can be. Seems like such a waste of money. Fireworks have always appeared to me as dangerous but I never wondered they can be this much life threatening, people should avoid the use of such things. This is a very detailed information about the facts and figures of fireworks in US. Yeah Fireworks though looks nice on parties but it's very dangerous to the same time.